Milestone birthdays are literally the best. Truly the best reason to throw a party! For this 40th birthday party, we worked with our client to style a fall inspired table for an intimate dinner for her husband's birthday. The dinner was for 17 people and was to take place in the couples Manhattan apartment. Parties in Manhattan apartments are our specialty and actually the reason I started this company. When I was living in a one bedroom apartment, before having children, I used to throw huge parties and worry I wouldn't have enough space. That was never the case. There was always plenty of room, so much so it was hard to get our guests to leave. Transforming a space into a party takes some skill and planning, moving furniture around, adding in compact party furniture such as cocktail tables, skinny dining tables and chairs. You need to be creative and come up with a way to best use the space to accomodate your guests. We styled the table with seasonal flowers and leaves. 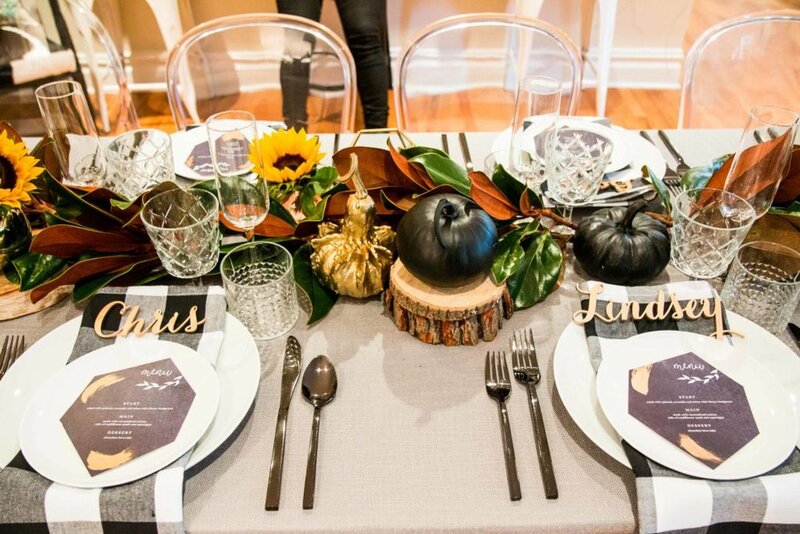 We styled gold and black sprayed pumpkins and gourds as well as birch planks to give some dimension to the table. Our client found the most fabulous laser cut name cards for each place setting and she hired a personal chef to take care of all the cooking so she could be a guest at the party without the stress of cooking for a large group. As well as the black matte utensils that we included in our rental order from Please Be Seated. The set up was so beautiful and the guests reportedly had a fantastic time. Just how a milestone birthday should be.